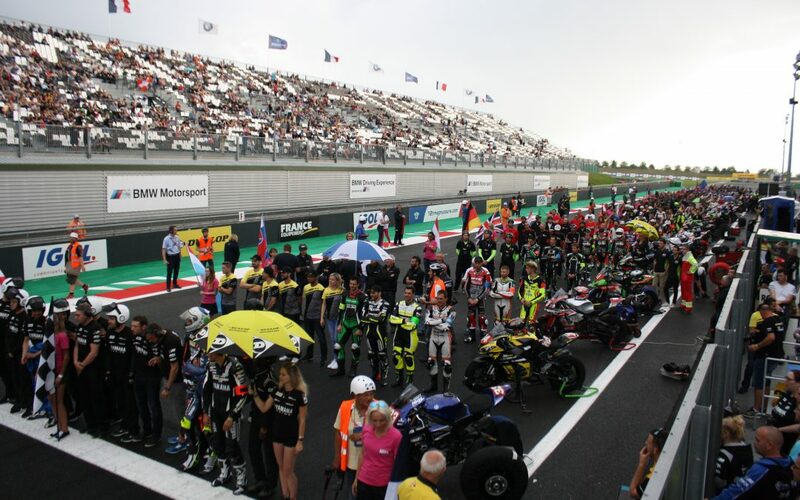 The 2018 12 H of Nevers Magny-Cours started yesterday. Today the Women’s Cup took place, after being encouraged by the Gridboys, it was Margaux WAHNAM who won the race, followed by Melody COIGNARD and GAËLLE REMY. On the subject of the 12 h Endurance race, the qualifying sessions for all the riders saw the German, Florian ALT for Yamaha Viltais Experiences, setting the fastest time on the Nièvre track, and winning a watch from our partner Lotus. It was followed by the first endurance race starting at 19:00 with 27 teams entered. After the Marseillaise and the European anthem had been played on the starting grid, the riders set off for 6 hours of night racing. At the finish of this race, the Yamaha Viltaïs Experiences team were in front, with a total time of 06:00:03.793, followed by the Aprilia Gribenstein team with 06:01:05.108 and SKY MOTO VITESSE / MSC 93 with 06:01:41.866. On the entertainment side, the circuit village was full of the rhythms and sound of DJ JAY STYLE and the applause of the public!